2 Okay, here's why he's not under Pearl's page. 8 Page for his Empoleon? 27 Ok, this has been bugging me for months now and I'd like and answer, please. Adding to the fire, but, seriously, the answer to the problem is in his name. If his game article is going to be called "Pearl (game)", then "Jun (anime)" should deserve his own page, BECAUSE he's not called Pearl. GLs, the five partners, all direct game references with no name changes don't deserve their own separate page. Okay, here's why he's not under Pearl's page. Because he's not Pearl any more than Gary Oak is Blue. Remember, Gary was as much a jerk as Blue. They even both said "smell ya later" I believe. Gary's team may not be based on Blue's in any games, but so what? What's to say Jun's last three Pokémon aren't something completely random? He has the same clothes. Great. He has the same team. Great. Gary has the same clothes as Blue in both RGBY and FRLG and he's got a separate article. 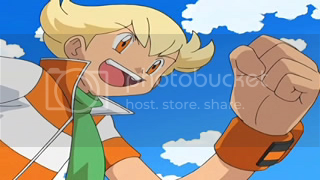 The title of the episode is Rival Trainer Jun Appears! not Rival Trainer Pearl Appears!. His name is Jun. Not Pearl. Just like how Kenta, not Gold, and Marina, not Crys, appeared in the Legend of Thunder special. Brendan and Lucas weren't given separate names nor even much of an appearance, but Jun appears in an episode titled after and focusing on him. Jimmy and Marina do the same in LOT, though they didn't exactly name the thing. Essentially, though, here's what it is: Game protagonists and rivals who appear in the anime get a separate page for their anime iteration if their role is large enough. Silver appeared in the opening for LOT, and nothing else (plus Silver is that old guy who everyone knows thinks is the idiot's dad anyway). Brendan was in the opening segment of three movies, but did little more than send out one Pokémon and order it to use a move. Whoo, give the man a page. No really. He's not notable enough in the anime for his own page. Lucas does even less; he battled only ONCE in a movie opening. Plus, well, with the exception of May and Dawn, all of the game protagonists and antagonists have different names from their anime counterparts. Satoshi, not Red. Shigeru, not Green. Kenta, not Gold. Marina, not Crys. Jun, not Pearl. Basically, from DP121 onwards the screen is wider than it was before. There's probably more to HD than that, but I'm not an expert. Ok, this has been bugging me for months now and I'd like and answer, please. "Dawn once mentioned Barry singing a duet with an Exploud. This is similar to his Pokémon Adventures counterpart." This page was last edited on 3 February 2014, at 19:04.